Harvest the flowers by simply plucking them easily off the stem. One flower tops one stem. If you don’t want all of the flower-less stems sticking up, just clip the stem back to the main stalk. I haven’t bothered to do that. I can tell you though that your hands will be very sticky after picking Calendula flowers. They are very resinous which is exactly what you want for good medicine making! Be sure to harvest the flowers on a dry, sunny day and preferably before the strong heat of the day. Dried Calendula flowers ready to use as needed! I generally dry the flowers upside down with the petals “splayed” with the green calyx on top. By the end of the season, though, I sometimes find myself simply placing the flowers randomly on a drying screen or basket drying tray making sure they don’t touch. I don’t think it matters which way you do it. What does matter, though, is that the flowers are separated and not touching. You also need to allow extra drying time. They dry beautifully on a tray setting a top your refrigerator. There seems to be enough added warmth from the refrigerator to facilitate drying the herb well. Just be sure to dry the flowers completely before storing them. If you store the flowers without being completely drying first they will mold. I store my treasured dried flowers in a glass quart jar and keep them in a cool, dark room. They keep well at least up to nine months and at most a year. This is one herb I find does not keep its potency much beyond a year. Good to replace and replenish yearly. 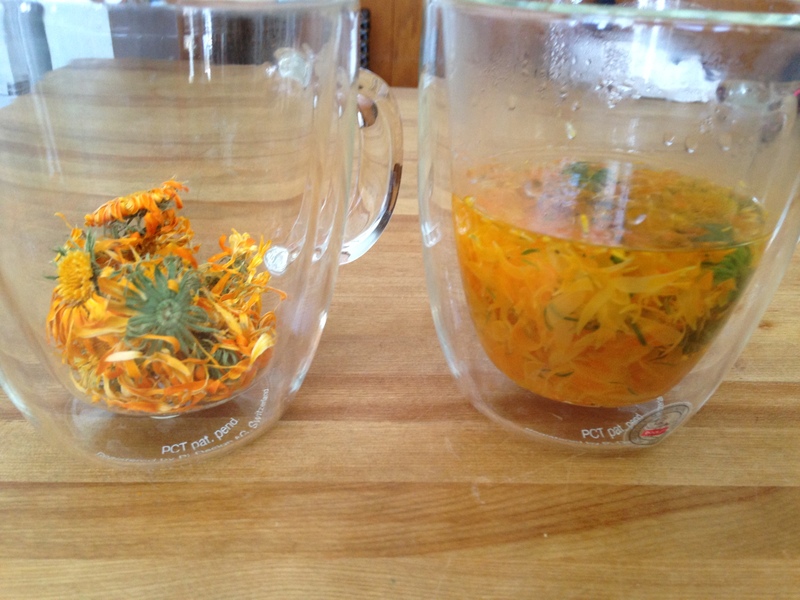 Comparison of dried Calendula flowers and re-hydrated flowers in water. Pouring hot water over dried Calendula flowers reminds me of the dried whole flower teas that “blossom” in a clear tea pot right before your eyes. You can strain and drink the infused water or use the calendula liquid as a wound-healing compress. It works beautifully for fresh scrapes and abrasions helping to heal the skin. And, it doesn’t sting when you apply it! An extra bonus. I let the flowers infuse twenty to thirty minutes for a stronger infusion for wound healing. 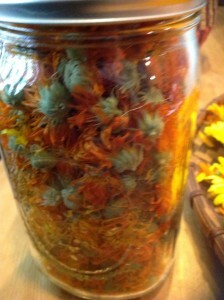 Infusing dried Calendula flowers in oil. Here I’m making a Calendula infused oil. I actually ended up making two separate batches using different oils with two separate uses for the infused oil. The process, however, is the same regardless of your choice of oil. 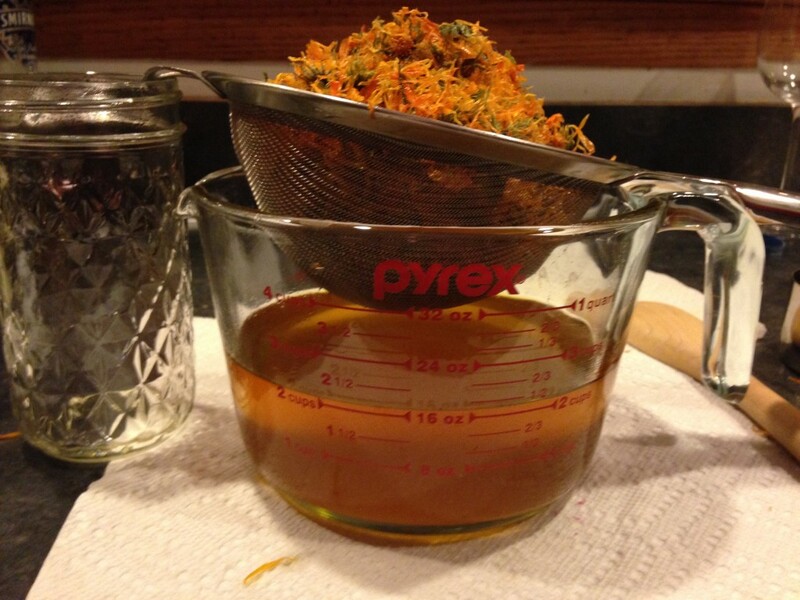 Basically, all you do to make a Calendula oil is to infuse dried Calendula flowers with whatever oil you choose. Here are a couple variations I made. I based my choice of oil on how I wanted to use the infused oil, for example, for a salve or ointment and a rich moisturizing cream. 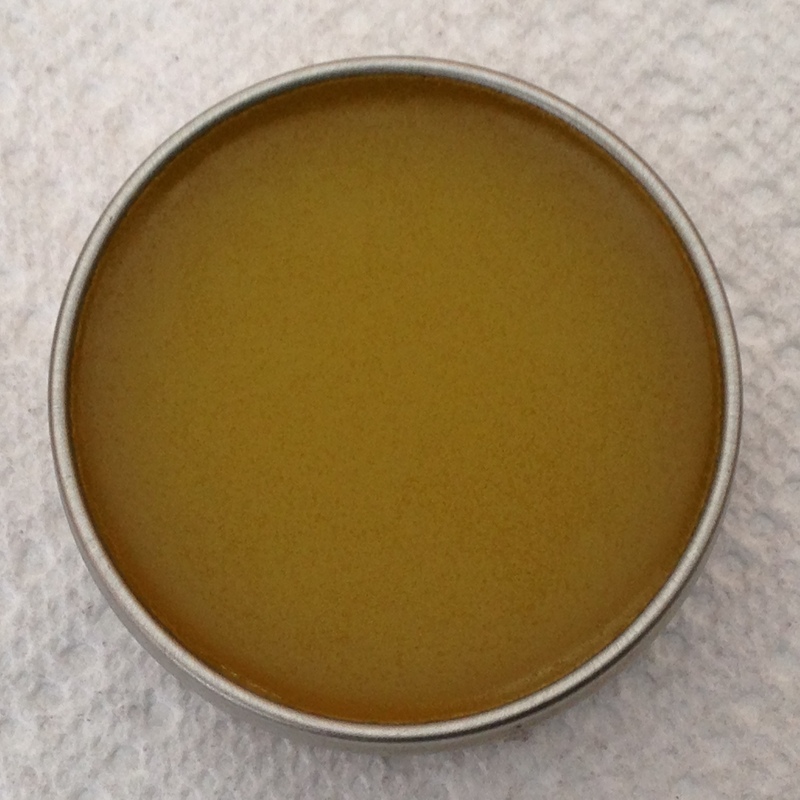 First recipe (salve/ointment), I made a Calendula oil using extra virgin oil. 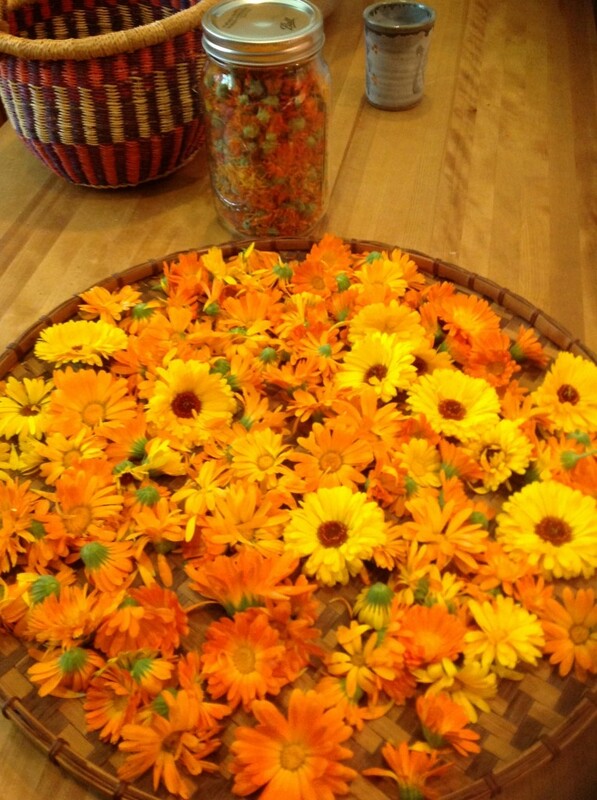 I measured 2 generous cups of dried Calendula flowers and 3 cups of the olive oil. The picture above depicts how concentrated the oil is with the dried flowers. I rub the flowers between my hands to break them up a bit before adding the oil. Mix the flowers and oil together well in a stainless steel bowl. The oil is saturated with flowers but not so much so that there are flowers not submerged and covered with the oil. I choose a bowl that I also plan to use for the infusion process. 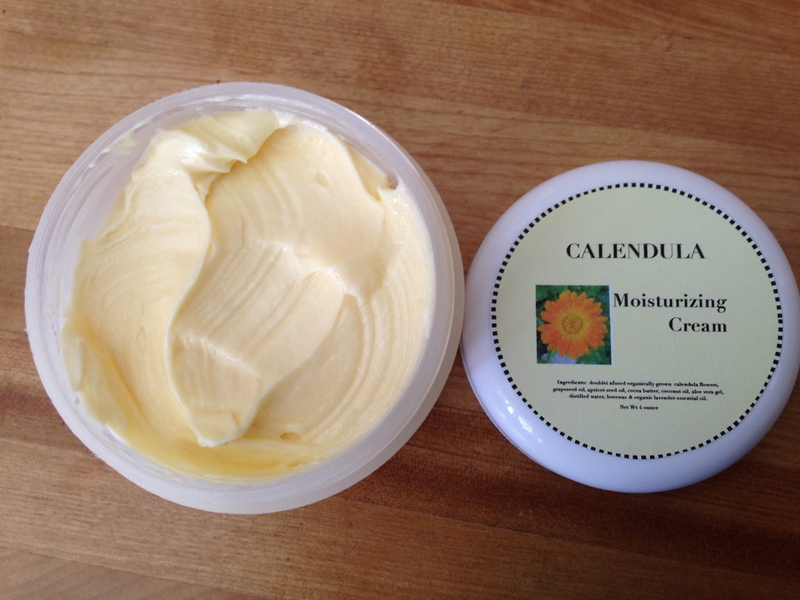 Second recipe (moisturizing cream), I used 2 cups packed dried Calendula flowers, 2 cups grapeseed oil and 1 cup apricot seed oil and continued to mix them together as I did for the olive oil blend. 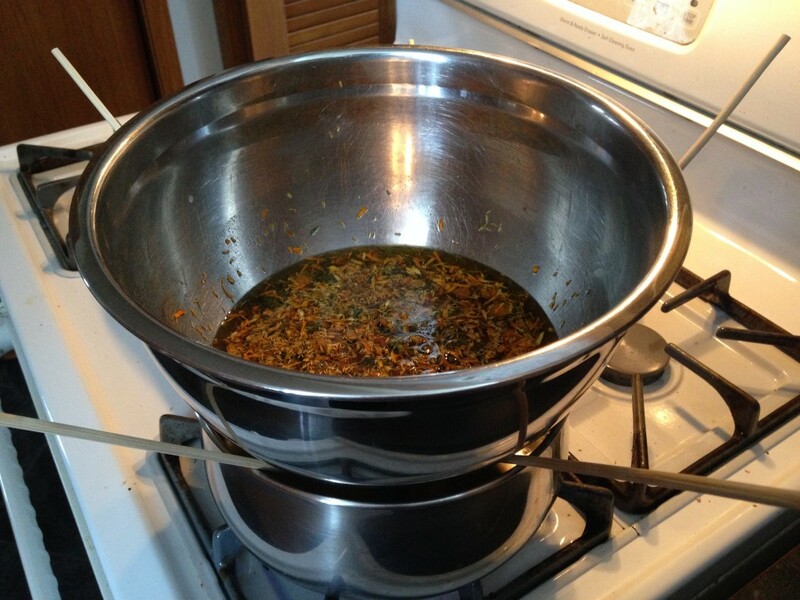 Double boiler method for infusing dried herb in oil. I have always used the double boiler method to infuse dried herbs in oil. You have to be careful that the water in the bottom pan doesn’t boil up and splatter into the top pan containing the oil and herb. However, this time I decided to try a method that Henriette Kress detailed beautifully in her recently published Practical Herbs book. And, I have to say it worked so well that I will be using this method for any time I want to make an infused oil using dried herbs. Basically, as pictured above, you simply place a stainless steel bowl over a half-filled pot of water and bring the water to a boil. Reduce the flame once the water starts to boil to a low boil. I infused the oil using this method for about two hours. I ended up adding more water to the bottom pan after about an hour. However, I strongly suggest you check that you have sufficient water in the pan holding the bowl so it doesn’t go dry on you! You separate the bowl and the pot using wooden skewers. The heavier-duty type skewers work the best to hold the weight of the bowl. I found mine in a regular grocery store. I placed five skewers around the bowl to separate the bowl from the bottom pan to balance the bowl on top. The beauty of this method is I don’t have the “water splatter” worry. I also found that the herbs didn’t get “crusty” from too much heat. The infused Calendula oil smelled wonderful and there was no hint of burnt smell to it at all. Compared to using a typical double boiler method, I found that at times the herbs got a little on the crispy side and hinted of a burnt smell. So, I highly recommend Henriette’s method. Works like a charm! I love making double-infused oils. I find they are potent and beautiful. The strained oil pictured above is a double-infused oil. It is simple to do. It just takes more time is all but it truly is well worth the effort. First, make an infused oil using the process just discussed. Strain the warm, infused oil directly off the heated pot of water. 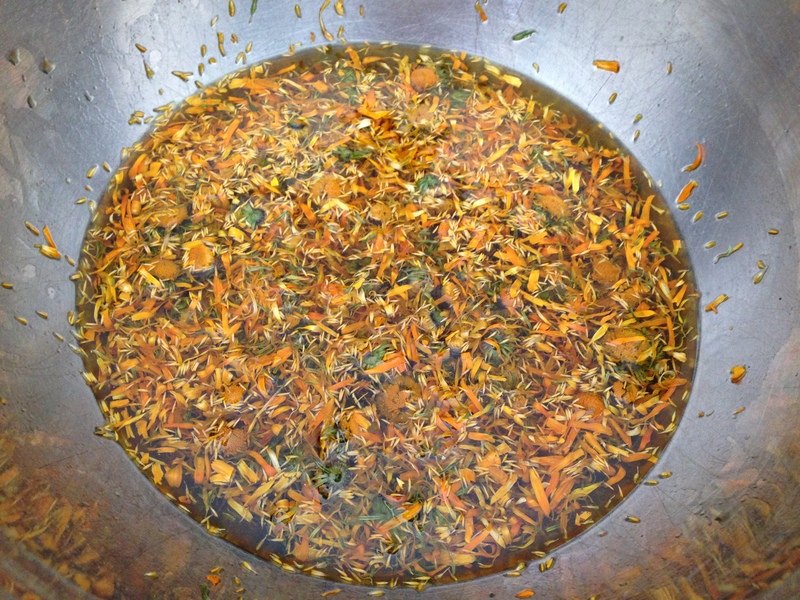 Now, add 2 additional cups of dried Calendula flowers (whole flower including the petals and green calyx) to the first strained infused 2 cups of oil. Stir well to coat the dried flowers with the oil. Return the bowl with the second batch of dried flowers and first infused oil and place the bowl on top of the pan filled about half way with water. Repeat the process using the wooden skewers. Bring the water to a boil and reduce to a low boil so the heat of the boiling water is heating the pan with the oil and dried flowers. This gentle bottom heat facilitates the oil infusion without burning the herb or oil. Continue to infuse the second batch of oil for an additional 2 hours. Add more water to the bottom pan half way through. Strain the oil-flower infusion well using a stainless steel fine mesh strainer. I let it strain thoroughly. Don’t rush it. You now have an incredible, potent double-infused calendula oil that you can use for different recipes and occasions! I pour the oil into glass jars and store in the refrigerator where it’s cold and dark. It helps to extend the life of the oil longer. I can’t give you an exact length of time the oil keeps, but I’ve had oil keep well up to a year this way. How much oil and beeswax you use depends on the amount of oil used in the first place. But, here’s a basic recipe. Place one cup of calendula infused oil in a double boiler pan. I have a small set that works well. Basically, one pan holds the water and the second plan on top holds the double infused oil. That way you don’t have the oil exposed to the direct heat of the flame making the oil too hot. Next, add 1 ounce of beeswax to the oil in the pan. I don’t use the beeswax granules. I love the smell and outcome of using locally harvested beeswax in a block that I chip off and weigh.You only want to heat the oil long enough to melt the beeswax and no longer. Keep a watchful eye! It happens quickly. If you want a firmer salve, simply add more beeswax. Some folks test the salve consistency by taking a teaspoon of the blend and placing it in the freezer briefly to see how firm it gels up. I generally like my salves firm enough so they “look” solid in the container, but soft enough that I can easily apply it to my skin. Pour into a container and let cool before putting the lid on. Be sure to label with the ingredients and date. The second recipe I made from this effort was a moisturizing cream. I’ve been making my own creams for year now and the only moisturizer I use on my face. There’s a tremendous satisfaction in making your own cream. I first started making my creams based on Rosemary Gladstar’s original Famous Face Cream recipe she so generously shared with the world many years ago. Of course, once I got used to making it I had to try my hand at using different combinations of oils and butters. I extend my gratitude to Rosemary for inspiring me to this day. So this time around I decided to try the recipe highlighted in Rosemary Gladstar’s more recent book, Medicinal Herbs, A Beginner’s Guide that features calendula oil. It’s treasure of a book by the way. I adapted the recipe some from the get go though in order to use the oil I had on hand. The beauty of making your own creams is “play time” with the ingredients! I actually find it challenging to repeat the exact same recipe time after time. It’s just too much fun to mix it up a bit and try new possible combinations! A few drops of lavender essential oil. Combine the calendula oil, cocoa butter, coconut oil and beeswax in a double boiler set and melt the oils, butters and beeswax together over low heat only until the beeswax melts. Pour the melted blend into a glass measuring vessel (i.e. Pyrex) and let the mixture cool to room temperature. It can take up to an hour to cool. I place a piece of paper towel loosely over the top of the dish while it’s cooling to keep out any air borne dust. Pour the cooled oils, butter and beeswax mix into a blender. The cooled blend will have a thick consistency to it. This is not a problem. It will eventually blend with the additional liquids add. That’s the total miracle of this whole process! Now, mix the aloe vera gel, water and essential oil together in a separate bowl. Then, add the water mix to the mix in the blender as gradually as possible. At times it seems like an impossible task to blend the oil/butters and the liquid. Just keep turning the blender on and off and scraping the sides. Be careful when scraping not to catch the spinning blades. (Something I manage to do on occasion.) Eventually, you will have a thick blended cream! Pour into your selected containers and label. SOME OF CALENDULA’S HELPFUL WAYS . . . . Some of my favorite authors and herbalists remind me just what a powerful plant partner Calendula is. Cech, Richo. Making Plant Medicine. Williams, Oregon. A Horizon Herbs Publication. 2000. Gladstar, Rosemary. Medicinal Herbs, A Beginner’s Guide. North Adams, MA, Storey Publishing. 2012. Kress, Henriette. Practical Herbs. Helsinki, Finland. Yrtit ja yrttiterapia Henriette Kress. 2011. Romm M.D., Aviva. Botanical Medicine for Women’s Health. St. Louis, Missouri. Churchill Livingstone. 2010. Soule, Deb. The Roots of Healing. New York, New York. Carol Publishing Group. A Citadel Press Book. 1995. Tilgner, Dr. Sharol Marie. Herbal Medicine From the Heart of the Earth. Pleasant Hill, OR, Wise Acres LLC. 2009. Harvest the freshly opened or partly opened whole flowers on a dry, sunny day, preferably not in the heat of the day. Separate the individual flowers on a drying rack so they are not touching each other. Allow to completely dry before storing. *All content on this site is provided for informational or educational purposes only, and is not intended as a substitute for the advice by your healthcare professional or physician.